So this week I have been kindly invited by Mari’s World to link up a post about twins for the twins, triplets and more carnival week being held over on her blog. 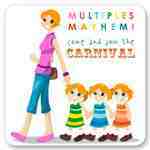 Surely this makes sense as one; I have twins and two; I have a blog titled Multiple Mummy. The irony being that actually as far a twins related issues I have only talked about Hyperemesis in my twin pregnancy and the choice of double buggy! Not particularly a vast amount considering I am supposed be multiple related. The thing is I find that once you have the ‘twin’ or ‘triplets’ or OMG ‘quadruplets’ you then just blend into being a family, and really that is how my blog comes across, as family life. However it has got me thinking, because when I first discovered I was having twins (which was a slight shock as my eldest was only six months at the time and it was slightly clouded by the high risk of down’s syndrome) people were full of their very helpful pearls of wisdom of ‘oh how hard was life going to be’ and that ‘I wouldn’t know what had hit me’. I am not for one minute saying that there aren’t days when you want to pull your hair out, or just lock yourself in the hoover cupboard in the hope they don’t find you, for just five minutes of peace so that you can try and remember your name, but that is just children isn’t it? For me I think I set the bar so high for how hard twins would be that actually, it never got to that point and it was a relief. I felt I was coping. So I am going to try and offer some practical advice if you know you are expecting twins – this is based on reflection and hindsight and is by no means an exact science. It is additionally one opinion, so if you find it is not for you, it does not mean you are doing it wrong, you just are doing it different. I hope you find it helpful! When you discover you are expecting (twins, single or more) and have recovered from the possible shock and delight, start putting things into your weekly shop – you can’t and will never have enough wipes and nappies, they are in size 3 and 4 for quite a while! Also, body wash, shampoo, nappy sacks, sudocrem are all useful items. Tell everyone that you only want baby grows in the first 6 months at least…you honestly will not put them into outfits up until then as they will be diddy and also they are only tiny for such a short while, cherish every moment they are baby. Two bumbo’s were essential items for us! Our twins were boy and girl so we never slept them in the same cot – they had separate moses baskets from the start and then separate cots. I personally think it helped with their sleeping. They didn’t disturb one another and I never had to worry about separating them. They do however share a room. We bottle fed from the start, it is my one regret that I didn’t try breastfeeding, even for just two weeks of goodness. That a personal choice – there is no right and wrong, you do what is right by you and the needs of your babies. Do not feel pressured. Get you other half on board from the start. I could never get mine to feed at the same time in the night…I was up constantly, so my husband started getting up for one twin in the night and me the other, and the next night we would swap babies, so we didn’t get to attached to one baby. If it is your first pregnancy, it will be a little easier as you can sleep during the day, but if you have other children, it will be trickier to rest. You must take every opportunity to go to bed early and rest when you can. If you can get them to combine feed, at least this could free you up a bit. it is just an option to consider. 8. Occupying other siblings kit! By the time mine were born I had a 15 month old. Invest in feed time activities for your older child because you will be out of action to play for long periods of time. I found nursery rhyme DVD’s, reading books, fetch me games worked best to occupy. Put your money into a good double buggy – it will be your life line. Check out my tips for ‘things to consider.’ when choosing a double pushchair. When the going gets tough go out – you will need a break from the four walls, always have a baby bag packed up the night before, so your never scrabbling about for bit, you will only need to sort bottles, go for a walk, get a coffee and breathe. It will all be okay -I promise. Ask your health visitor if you are entitled to Home Start – it is a brilliant service that provides home help to families with multiples. it is not in every area yet but worth finding out. I also took on a student from our Local college who was training to be a nursery nurse – again more help. When people come to visit – direct them to the kitchen and ask them to make tea! Honestly they will want to and if they offer their services in other areas never say no…it trails off as they get older, at the point they start to move, so accept all help whilst you can. Direct them to the ironing pile so you can chat, ask to hoover. If they are true friends, they would not ask and not mean it. One bit of advice that another set of twin parents said to us was if they are asleep don’t let people disturb them, they will have to wait to pick them up, so you can try to establish a routine. To be honest I think the first six to eight weeks don’t really count as they are so newborn and that is your first lots of visitors, so cuddle away, but it was sound advice from then on! it has been the most brilliant experience, full of joy, giggles, some ups some downs, you just roll with it. I would not have it any other way, and if I have another O would not be devastated if it was twins again, in fact hubby and I would find it hard…we would have to share again! 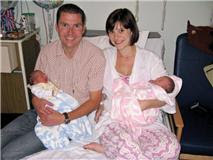 I wish I’d found your blog before my twins turned up! Lovely to read that everyone else is going through the same or similar things.